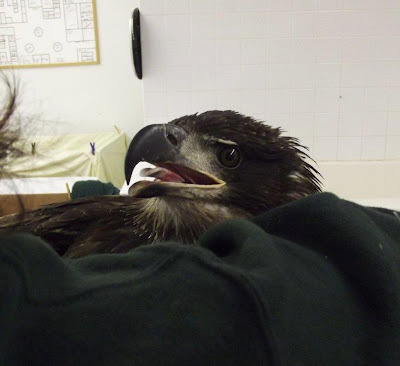 Taking Flight: Herky the Bald Eagle Update!! Poisoned Red-tailed Hawk admitted, Red-eyed Vireos Admitted with Migration Exhaustion, Trumpeter Swan cygnet update. 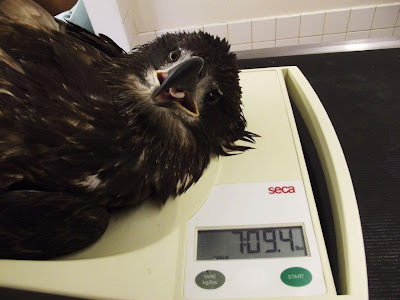 Herky the Bald Eagle Update!! 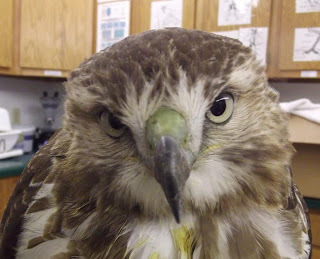 Poisoned Red-tailed Hawk admitted, Red-eyed Vireos Admitted with Migration Exhaustion, Trumpeter Swan cygnet update. We love great stories here at REGI. Improbable success stories, are all the sweeter. We are honored to live the recovery stories along with our patients. 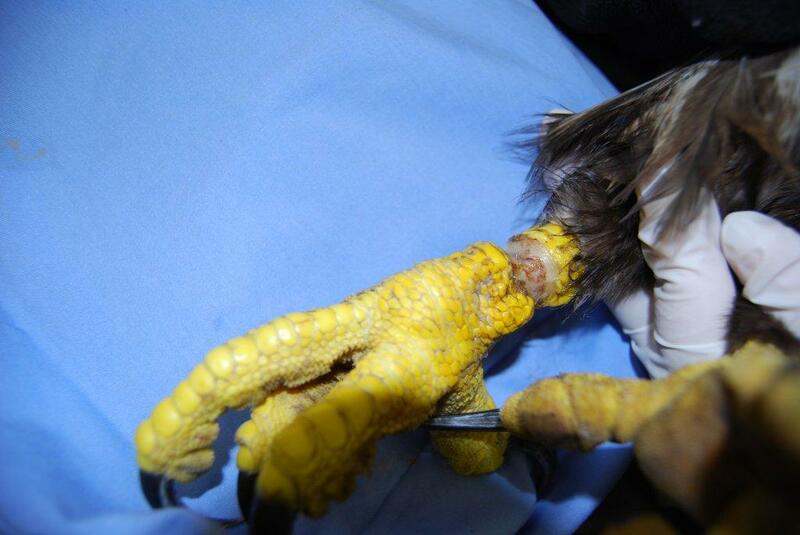 The story of Herky the Bald Eagle from Hayward, WI began on September 4, 2011. It has been only twenty days, but what a difference that time has made for Herky the Bald Eagle. 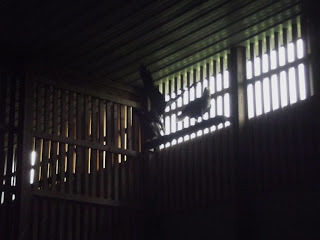 The story of her rescue and link to the video of the actual rescue can be found in the September 7, 2011 blog . If you have not seen it, I urge you to watch at the link provided below. http://www.2dorks.com/Eagle.html Her story continues below. Herky on the scale this morning. 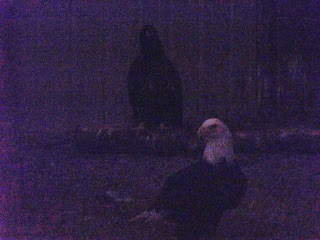 Look at that confident eagle face! ﻿ ﻿﻿﻿﻿ "Herky" the Bald Eagle rescued near Hayward, WI by the Bill Obenauf family, of Davenport, Iowa is doing great. She has gained weight by leaps and bounds and is starting to fly again. Herky weighed in this morning at 7.094 lbs which is a gain of 3 lbs in the twenty days since she was admitted. Herky fans in Iowa are all abuzz about this magnificent young eagle and her story. So, let me tell you about her. When I last updated Herky was still in critical condition. She had gained a few ounces however we were not yet celebrating. When any animals weigh sinks to half what is normal for them...the situation is dire. To add to the starvation issue Herky had a serious leg injury caused by cord wrapped tightly around her leg. Frankly, it was a miracle she had circulation in the foot when she was found. Our job was to make sure that good luck continued for her leg as well as navigate her through the turbulent waters of starvation and the associated fungal problems that affect birds when they are severely compromised. The cord from the snare was wrapped tightly around the eagles leg. It did serious damage to the surrounding tissue. In this photo the unhealthy tissue was debrided to allow the leg to heal from the inside out. We will never know for sure how her story goes before Herky came into captivity on September 4. Our patients cannot tell us their story. We have to piece it together as best we can. 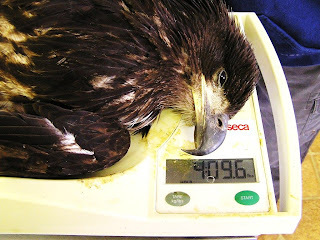 It is possible Herky was likely a healthy young eagle before she somehow came upon the snare someone left in the woods. The cord became tangled around her leg. Unable to get the cord off, it twisted tighter until it embedded into the skin. The cord may have been around the leg for weeks before she was found. Encumbered as she was with the snare, and increasingly swollen and painful leg, Herky was unable to find food. A domino effect of disaster had begun. Herky today with her "foster dad". Dad is in front of her protecting her from my intrusion. The photo is poor quality from our monitor. Today Herky, aka Herky Lerky, aka the Herkster is enjoying life with 3 foster siblings and 2 adult eagles, one our foster dad, in a 40' long flight. It is a smallish flight for an eagle, but just the right size as they recover from injuries and have limited activity again. Our foster father eagle is in the flight as well with the two youngest Bald Eagles chicks. Herky is the terror of her flight room! She is bossy and LOUD. She screams at everyone else during feeding time as it to say, "step away from the food" or else. In general Herky is "feeling her oats". 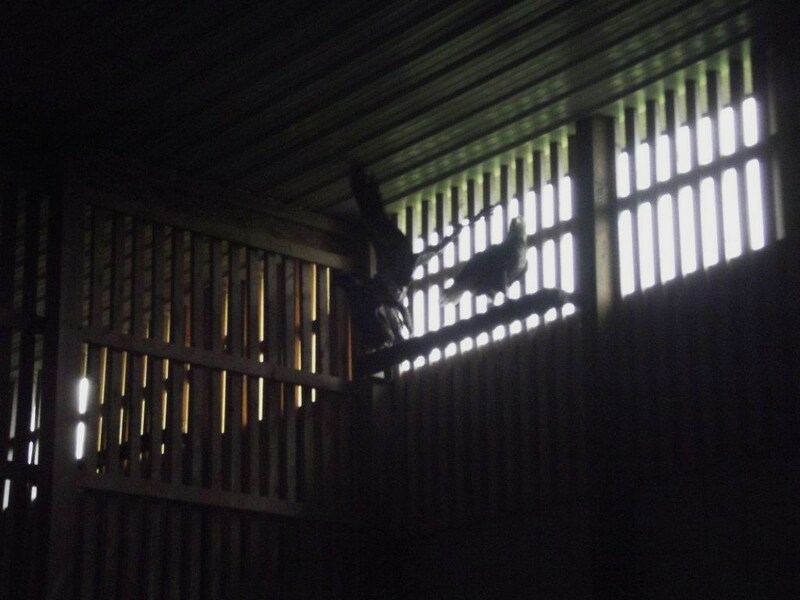 We sometimes see this behavior in eaglets when they have been through a traumatic situation. It seems they are so pleased to have survived, they take life to an entirely new level. You can be when she leaves here for her second chance in the wild, she will be living life to the fullest. Another monitor photos...but that is Herky in the middle on the highest perch (28 ft high). She is trying to "remove" a foster sibling from the perch with a one two punch with her wings. An adult female stands to the right. In short, Herky is doing superbly and progressing quickly now. We are very encouraged by her progress and weight gain. She does not ignore feeding time that is for sure. Thank you everyone for keeping her in your thoughts. I wish every young eagle in trouble had such great friends. Two of the five young Eastern Bluebirds just before they were released last week. They are still in the area and continue to eat the insects put out for them as they integrate into the wild flock that is currently in our area. 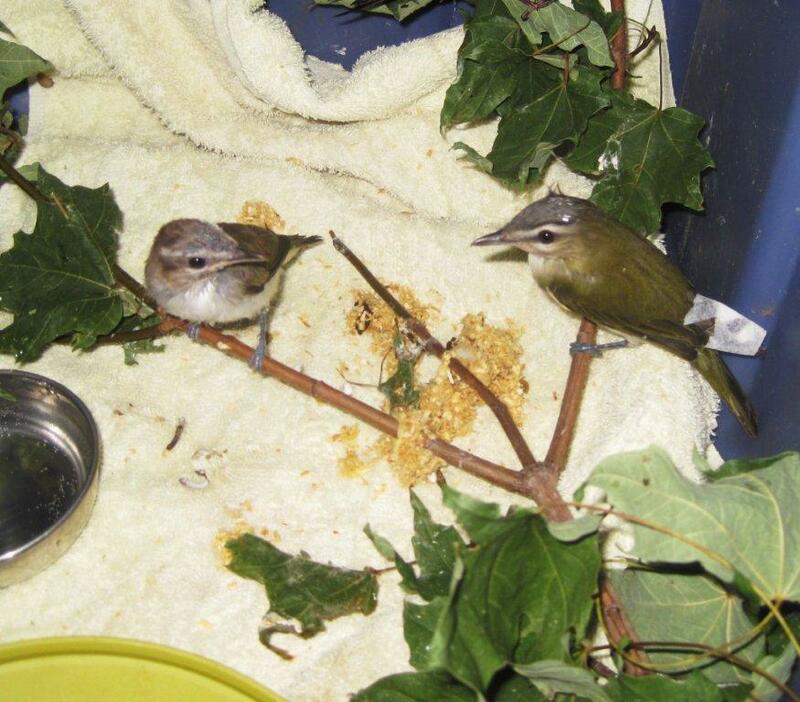 Two Red-eyed Vireos are recovering at REGI. We often receive neo-tropicals such as these beautiful and delicate birds during their migration especially when our temperatures plunge and the insects that they eat are in short supply. Just admitted an hour ago a juvenile Red-tailed Hawk from the Stevens Point area. He is suffering the effects of an organo-phosphate toxin. We continue to be very busy at REGI we are admitting several birds a day including every species imaginable from Trumpeter Swans to Ravens and Red-tailed Hawks thru Bald Eagles. We currently have about 150 patients. 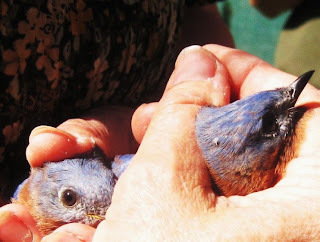 We have done many releases during the past two weeks including 5 Eastern Bluebirds and 9 American Kestrels. Katie as she brings the cygnet Trumpeter Swan, admitted from Minnesota, in for the night. Our nights are getting mighty cold in the northwoods and this late baby is still in down and unable to stay warm himself during our frigid nights. We have so much more to talk about. I wish we could share each patient and all of our days with our incredible patients. Stay tuned... Each day is a new adventure.